Conservatives with high school degrees, bachelor’s degrees, and graduate degrees all experienced greater distrust in science over time….In addition…conservatives with college degrees decline more quickly than those with only a high school degree . These results are quite profound, because they imply that conservative discontent with science was not attributable to the uneducated but to rising distrust among educated conservatives. This is presumably part of the wider conservative turn against knowledge-disseminating institutions whose output is perceived as too liberal (academia, the mainstream media, Hollywood) in favor of institutions that produce more reliably conservative narratives (churches, business-oriented think tanks, Fox News). More and more, liberals and conservatives are almost literally living in different worlds with different versions of consensus reality. An interesting side note to this is the startling lack of trust in science among moderates. After a drop in the 70s, it’s stayed pretty steady for the past 30 years, but it’s stayed steady at a very low level. 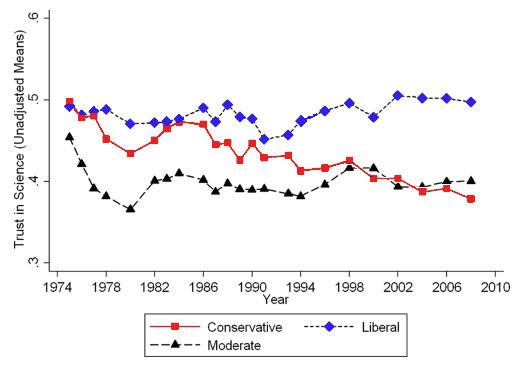 Until recently, moderates trusted science significantly less than either liberals or conservatives. Is this because moderates have always viewed science as a politicized enterprise, something they’re especially sensitive about? Or because moderates are just generally less engaged with elite institutions? Or because moderates have a higher overall degree of skepticism about everything than either liberals or conservatives? It’s a mystery. More here from Chris Mooney, whose hypothesis Gauchat was testing.